I’m an avid gamer. I’ll admit that it’s a pretty solitary hobby (70 hours spent on Dragon Age solitary)--other than some pwning on Halo Reach, there isn’t a whole lot of player interaction beyond Xbox Live. 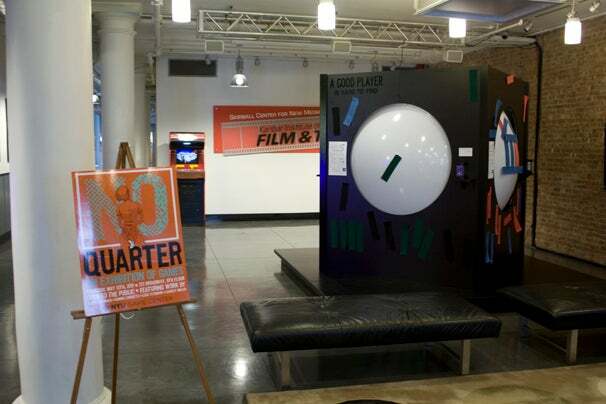 So if you’re in the New York area, I highly recommend heading up to the 9th floor of the New York University building at 721 Broadway and check out the No Quarter event by the NYU’s Game Center. Not only will you be check out some very cool new game designed by NYU students and indie programmers, you’ll have fun mingling with your fellow gamers. 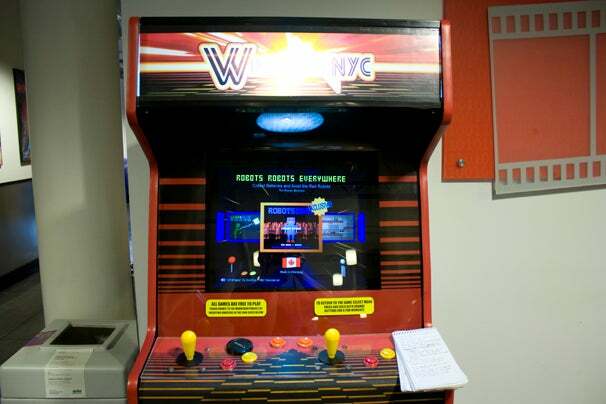 Four games are showcased, along with an arcade cabinet specially loaded with a variety of indie games. The event is open every weekday from 10am to 5pm., from now to the end of May. At a Distance is a great little geek treat of co-op gameplay and multidimensional thinking by way of Terry Cavanagh, who may be best known for designing VVVVV. I won’t give away the whole thing, but the basics are player 1 on the left explores the environment, while player 2 on the right builds the environment that player 1 is in. Otherwise it’s a challenging puzzle that requires a lot of teamwork and smashing of brains. Plus, it uses some really great super florescent ASCII style art, too. This game by Charley Miller is completely unrelated to technology, but it’s just as cooperative as it is competitive. So what you have is a giant volleyball with four colored circle adhesive patches attached to four sides. Players at opposite sides are supposed to work together to run the same band of color, laid out by more patches, to the next circle. Meanwhile adjacent of the team are the opponents trying to off the other team’s path and make the same goal. Players take turns spinning the ball and they have to add and remove a piece during their turn. Of course, if you want to just play a throwdown match, there's Horka by Ramiro Corbetta. It’s basically just soccer with box pixels, orange versus blue. Grab the ball to your goal and get it out of your opponents’ goal. Clock by Luke O’Conner is the only game you can play by yourself, and it's extremely simple. All you have to do is rack up seconds before the clockwise scrolling white line hits a red one. When you hit the space bar the white line teleports to the other side of the circle. It’s not mind-bogglingly complex, and it’s pretty slow to get started, but it's oh-so addictive. Last up is the arcade cabinet setup on the back wall, and it’s loaded up with games exclusive to No Quarter--with some good enough to go to PSN or Xbox Live Arcade. Among the few I played was X-Bones by Chevy Ray Johnson--a “duel at sunset, draw!” type of game with ninjas and bones. Cephalopods Co-Op Defense by Spooky Squid Games played like a top-down zombie mode from Black Ops caught in a Scott Pilgrim art world, where one player is the designated shotgun-man and the other can build walls. Feel free to party up in our comments thread. Homebrew Computer Plays Homebrew Asteroids!